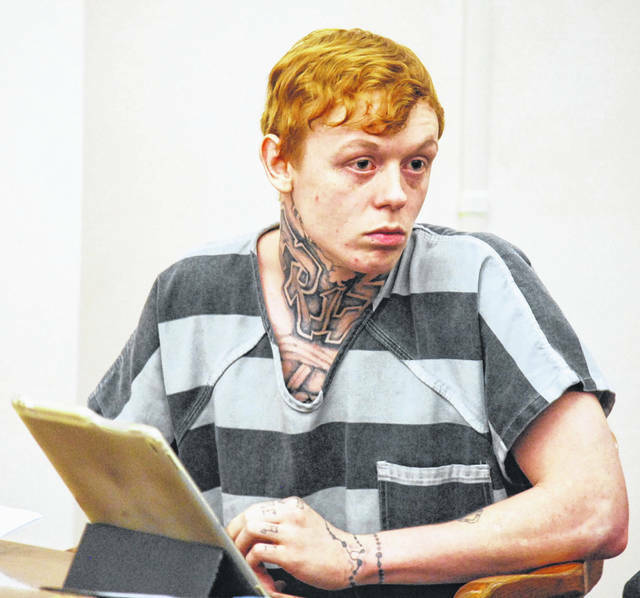 Shawn Russell, 22, appeared Monday in Allen County Common Pleas Court. Russell’s attorney asserted that his client’s Miranda rights were violated during police interviews. LIMA — One of two Lima men charged with an armed robbery at the Lima West Apartments earlier this year appeared in court Monday in an attempt to have statements he made to police ruled inadmissible. Shawn Russell, 22, was indicted in April by an Allen County grand jury on charges of aggravated burglary, a first-degree felony, and robbery, a felony of the second degree. He is scheduled to stand trial on Aug. 21 in Allen County Common Pleas Court. According to court documents, officers were dispatched to the apartment complex on in the 1800 block of Cole Street on March 11 of this year in reference to a robbery in apartment 67. The residents reported they were ordered to lie on the floor and were robbed at gunpoint by an unknown white male who was wearing sunglasses and a bandana over the bottom half of his face. Early on in the investigative process, Russell was suspected of being complicit to the robbery and officers began searching for him, according to court records. Shortly thereafter, police were also able to identify the masked robber as Joseph Swinehart, 20, of Lima, according to police reports. Investigators subsequently located both Russell and Swinehart in a vehicle on the lot of the Lima Estates Apartments, 760 E. Fourth St., and took the men into custody for suspicion of robbery. Assistant Prosecuting Attorney Destiny Caldwell provided the judge with a disc containing the interview in question. Reed said he would rule on the defense motion in the near future. https://www.limaohio.com/wp-content/uploads/sites/54/2018/07/web1_Shawn-Russell-motion-hearing-July-23.jpgShawn Russell, 22, appeared Monday in Allen County Common Pleas Court. Russell’s attorney asserted that his client’s Miranda rights were violated during police interviews.